L = 865 mm, W when tied = ca. 250 mm, L fringe = 26.5 mm, W grass strips = 4 mm, W hide ties = 4 mm, diam fibre cord = 2 mm [RTS 13/7/2004]. Acquired by R.P. Elderton in 1909, while serving in the Egyptian army [RTS 13/7/2004]. Waist girdle consisting of several short lengths of flat yellow grass (Pantone 7508C), all cut to the same length and doubled over at the top to form a series of small bunches. These were placed side by side and knotted together using flat strips of a darker brown plant fibre (Pantone 7532C), creating a fringe. This was then made of double thickness by sewing a second fringe behind the first, using twisted plant fibre string, possibly cotton, in a broad tacking stitch across the top; this string is secured in a knot at either end. Fastening ties were made by twisting the ends of the plant fibre strips to form a short, triple-stranded cord that extends from either end of the girdle, with additional narrow strips of brown animal hide knotted onto their ends (Pantone 7504C). One of these strips is partially covered with long golden animal hair on one face (Pantone 7403C), and terminates with a large loop, secured with a further knot. The girdle is complete, although some of the grass fringe strips are bent. It has an extended length of 865 mm, and weighs 20.1 grams. When tied, the girdle has an internal width of around 250 mm, suitable for a child or very small waisted woman. The fringe itself is 26.5 mm long and 3.8 mm wide across the top; each grass strip is around 4 mm wide; the twisted fibre ties have a diameter of 2 mm and the hide ties are 4 mm wide. Acquired by Rowland Percy Somerset Elderton in 1909, while serving in the Egyptian army. This fringe was worn by women on the upper reaches of the Sobat River. Accession Book Entry [p. 126] - MAJOR R.P. ELDERTON, WOODLANDS HOUSE, SHEFFORDS WOODLANDS, NEWBURY, BERKS. (Served in Egyptian Army, 1903-25). [p. 127] 1952.5.61 - ATWOT Tribe (as above) [on the R. SOBAT which flows into the White Nile from Abyssinia]. 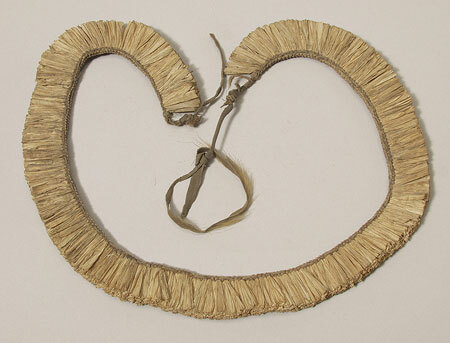 Woman’s waist girdle; grass, 1” deep, 24” long, fastened with hide cord. Card Catalogue Entry - The card repeats the accession book entry, with further comment 'coll. by donor 1909' [RTS 2/2/2004]. Related Documents File - Letter from Elderton, dated 1 January 1952: 'It has been suggested to me by Mr. Coghlan of the Newbury Museum that as you have a considerable number of Sudan exhibits you might perhaps like to have all or some of the following items which came into my possession during my Service in the Egyptian Army from 1903 - 1925. ... 4/ A ladies "Ascot" frock from the upper reaches of the Sobat river - a tributary of the White Nile. This is a grass girdle 1 inch deep! '. It is mentioned again in a second letter, dated 27 April 1952: 'From the Atwot Tribe (on the Sobat River which flows into the White Nile from Abyssinia) in 1909. B/ A Lady's Dress. A grass girdle 1 inch deep. ... I have made out the foregoing formal Inventory as your authority for your additions to your Catalogue, in case somebody should ever challenge any item. I have heard of such incidents occuring elsewhere! ...' [MOB 5/2/2002]. Old Pitt Rivers Museum label - SUDAN: - ATWOT TRIBE (on R[iver]. SOBAT). Woman's waist-girdle. 1952.5.61. d.d R.P. ELDERTON [circular metal-edged tag, tied to object; RTS 13/7/2004]. Sparks, Rachael. "Anuak waist fringe" Southern Sudan Project (in development). 03 Jan. 2006. Pitt Rivers Museum. <http://southernsudan.prm.ox.ac.uk/details/1952.5.61/>.